Moscony 48" Single Sink Vanity Set in Espresso - Design Element -SKU#J48-DS The Moscony 48â€ single-sink vanity is uniquely constructed of quality woods, simple lines, and a dark espresso finish, complemented by a beautiful quartz countertop and rectangular under-mount sink. Being twice as hard as granite, harder than steel and titanium, and possessing a hardness just below that of gemstones, quartz is an ideal material for countertops. It's hygienic, because bacteria can't penetrate the surface, and practically maintenance-free since no sealing, polishing, or reconditioning is required. Moreover, quartz doesn't stain and is more heat-resistant than other countertop materials. 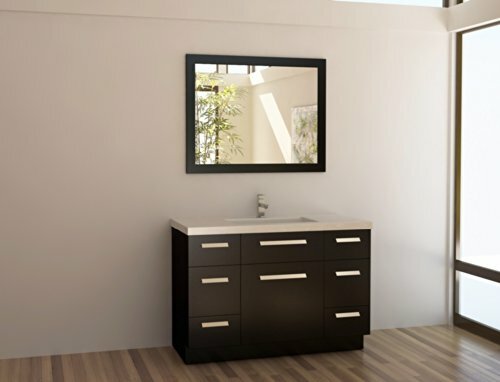 This modern vanity is well equipped with four pullout drawers (one in each corner) and three soft-closing cabinet doors (across the middle of the vanity). A framed matching espresso mirror is also included. Dimensions55"x41"x40" Faucets not included. If you have any questions about this product by Design Element, contact us by completing and submitting the form below. If you are looking for a specif part number, please include it with your message. Silkroad Exclusive Bathroom Vanity HYP-0902-WM-UWC-38-R Kelston 38"
Silkroad Exclusive Bathroom Vanity HYP-0224-T-UWC-48 Ashley 48"